Anyone with a job knows: work can get very stressful. For many people, stress can cause you to feel down, hurt work productivity, and affect mental health. 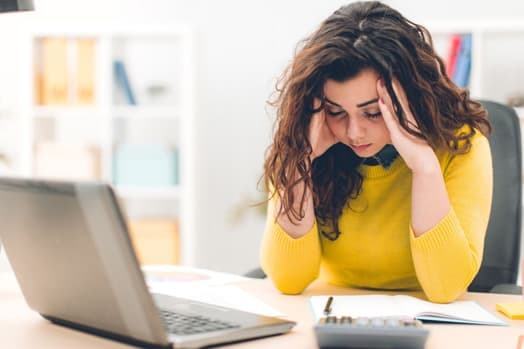 Yet, stress at the workplace is alarmingly common — according to some surveys, about one-third of employees feel their jobs are harming their physical or emotional health. Instead of letting it drain your body and health, take these precautionary steps to tackle the tension head-on and feel your best day after day. Any doctor would agree that eating whole foods and performing regular exercise will help you stay healthy. But it also improves your state of mind! Physical activity can release endorphins, which can improve your mood and relieve pent-up stress. Food also plays a huge factor in how you feel from day to day. Skipping meals or eating fatty junk foods might make you feel good in the moment, but they can hurt your health and performance. Instead, try cutting down on caffeine (if you tend to rely on it) and eat healthy foods full of vitamins and nutrients to give your body what it needs to feel its best. Why wait for your vacation to give yourself a little rest? Take time during each workday! Instead of pushing yourself throughout the day and draining your batteries, give yourself some time to recuperate. Get away from your desk and take regular breaks while working. Eat your lunch away from your desk or try going for a nice walk outdoors every hour or so — you’ll get the blood flowing, wake up your body and mind, and get some extra exercise. Having great relationships with your colleagues can help you build a support network to handle stress and occasional anxiousness together. Also, when you enjoy the people you work with, you’ll feel better on the job and less stressed too. Make the effort to set up meals and lunchtime activities to hang out and bond with teammates. Cheerful and funny conversations will help you overcome a negative state of mind and better handle any obstacles that come your way. Do you find it hard to “switch off” at the end of your workday? Do you find yourself checking emails late at night or during the weekends? Unfortunately, that makes it a lot harder to distance yourself from the office and get relief from the stress that’s holding you down. Leave your work where it belongs: switch off your emails and set aside time to relax when you get home. You can even try adding an end-of-the-day relaxation strategy to switch from “work” to “life.” Meditate after you get home or go for a quick power walk to help relieve tension and lift your mood. Now you can actually enjoy your evenings and weekends! Even with all your best efforts, there will inevitably be days that push you to the brink. That’s totally normal. When things get tough, it’s important to treat yourself to activities that give you the self-care you deserve. Make a nice hot bath and soak in peace and solitude. Go for a light jog through a beautiful park. Do some relaxing yoga. Read your favorite book with a cup of delicious tea. Listen to some soothing music. Get an invigorating massage. As long as you find it peaceful, relaxing, and healthy for your body and mind, it’s perfect. And if you need an extra boost to lift your mood and feel more relaxed, you can also take a dietary supplement with the nutrients your body needs to perform its best. Try Lumiday — the powerful formula with 12 key ingredients to help you feel great all day long. Lumiday is GNC’s #1-selling mood enhancing brand for a reason. Click below to learn more about how it can help you turn the tide on even the most stressful days and give you the relaxation and relief you need.